The Penguins and Capitals series should be high scoring and close -- and Sid vs. Ovie Round 2 might be even better than the 2009 version. SERIES STARTS: Thursday, 8 p.m. ET, in Washington. It’s almost hard to believe this needs to be said, but the Capitals really need to get their offense going in the second round. Washington scored twice in the final three games of the first round, and while that was against an admittedly stingy Philadelphia Flyers club that had otherworldly goaltending from Michal Neuvirth, that’s uncharacteristic of this Capitals team and now isn’t the time for the offense to start to sputter. Alex Ovechkin came to life early, but he was actually held off the board in two straight elimination games as the Flyers made the series much closer than it should have been. If it wasn’t for Nicklas Backstrom’s Game 6 goal, the Capitals very well could have gone to seven games. The positive in all of that, though, was that the first round may have proven not only to pundits but also to players inside the Washington dressing room that they can defend with the league’s elite. The Capitals only allowed six goals against in a six-game series. After he started to slow down near the end of the campaign, Braden Holtby was game- and series-changer for the Capitals and out-duelled Neuvirth in a Game 6 blanking of the Flyers. If the Capitals are going to continue to get that out of Holtby, it might not matter what the Penguins throw at the netminder this series. When he’s on his game, he’s among the absolute best goaltenders in the world. In a series that is going to be fairly even, though, the difference could be special teams, and the Capitals have shown they can be punishing on the power play. Washington had the fifth best power play in the league during the regular season and their five power play goals in one game in the first round shows just what Washington is capable of. 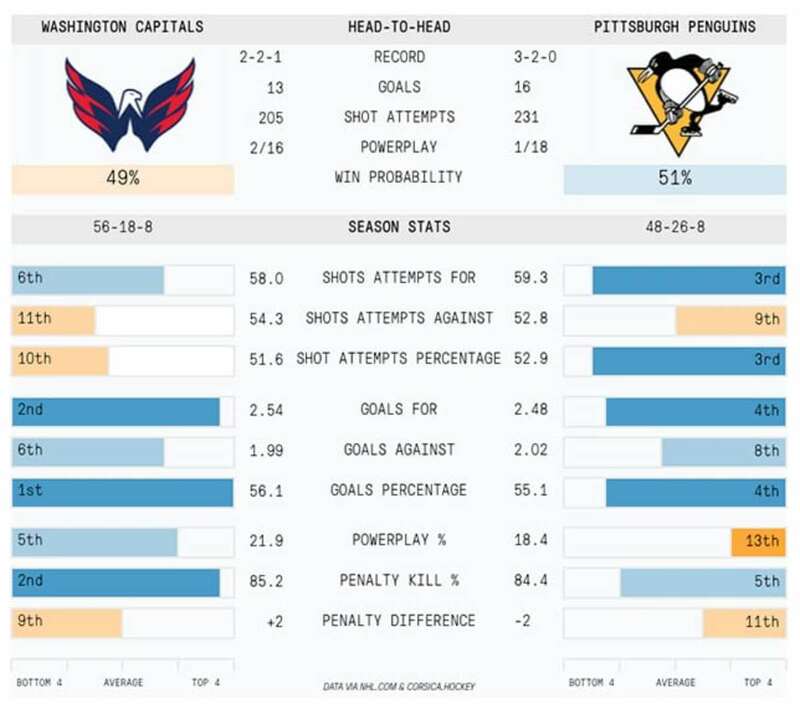 The Penguins are a much more disciplined team than the Flyers in the regular season, though, so it’s going to be of utmost importance that the Capitals connect when they get the chance. One big concern for Washington is going to be third- and fourth-line production. Because even when the big guns like Ovechkin and Backstrom were shut down against the Flyers, the Capitals’ depth players didn’t take over. Holtby’s one point puts him ahead of five players who suited up for at least half of the opening round, and contributions from Andre Burakovsky, Mike Richards, Daniel Winnik or Tom Wilson could go a long way. The Penguins were the hottest team coming into the post-season, and they picked apart the New York Rangers in the first round, continuing to look like world-beaters in the process. It wasn’t even close. Through five games, the Penguins averaged more than four goals per game — the most of any team in the first round — and that was against a world class goaltender in Henrik Lundqvist. That’s good practice for Pittsburgh’s roster of snipers, too, because they’re about to come up against another top-tier goaltender in Braden Holtby. Possibly the biggest advantage the Penguins have in a series where the stars on both teams could cancel each other out is that that their depth players are clicking. Tom Kuhnhackl, Matt Cullen, Conor Sheary and Bryan Rust each had three points in Round One. If that production carries through to the second round, it could tilt the series in Pittsburgh’s favor. There’s no doubt Sidney Crosby is going to see a lot of Karl Alzner and Matt Niskanen, just as he did during the regular season. The depth players will need to attack the second and third pairings of the Capitals. As the Flyers showed in the opening round, Alex Ovechkin and Co. can be held off the score sheet if there’s special attention paid to doing so, but that can’t come at the risk of exposing other lanes. Ovechkin seems incredibly focused this post-season and no team is going to stop him from getting shots on goal. Where those shots come from could be the difference, though. And while the biggest spotlight is going to be on Crosby versus Ovechkin, the battle of two generational stars, the Penguins net is going to worth watching. Marc-Andre Fleury hasn’t been ruled out for Game 1, but he hasn’t the past 10 games and his last start came nearly one month ago. Will he be rusty from the lack of game action? And if Fleury doesn’t play, there will be those who wonder about Matt Murray’s ability to slow down a strong Capitals attack. He started twice against Washington this season and allowed three goals against in both games, though he faced 30-plus shots in both outings. CAPITALS: Even though he led the Capitals in scoring during the regular season, Evgeny Kuznetsov can fly under the radar when talking about Washington’s stars. He didn’t have a good first round against Philadelphia and only scored once, but if he gets going, he could be unstoppable. Only three players all season had more three-plus point games than Kuznetsov, who had eight, and that should tell you about all you need to know about his ability to change a game with the puck on his stick. All he’ll need is one big game to get going. If that happens to be Game 1, this series could shift in Washington’s favor in a hurry. PENGUINS: There are those who will laugh heartily at the suggestion, but this could be the series where the acquisition of Phil Kessel pays the biggest dividends for the Penguins. Kessel has already had a good post-season with three goals and six points in the opening round. Over the course of his career, Kessel has 16 goals and 27 points in 27 playoff games. Pittsburgh could make it a short series if Kessel can get free and keep up his point per game playoff pace. 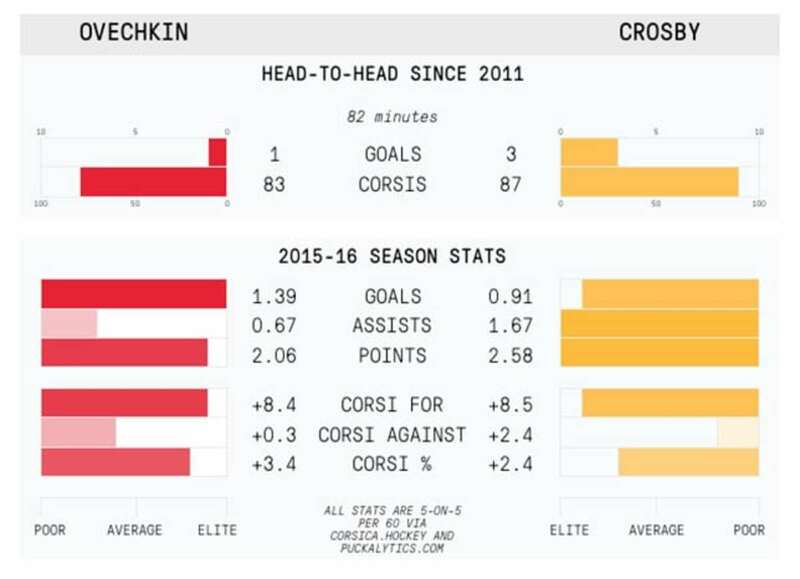 Of course this series is all about Crosby vs. Ovechkin. It’s always been them. It’s their first playoff meeting since 2009, and boy was that an epic clash. Thrilling OTs? Game 7? Duelling hat tricks from the two stars? It was an instant classic, and there’s no reason to think this series will be any different. It starts with ‘Sid’ and ‘Ovie’ who will surely be at their best. Crosby gets the points, but Ovechkin gets the goals. They’re obviously elite at what they do and you didn’t need a chart to tell you that. Both had nearly identical offensive possession impacts this season with the edge on defense actually going to Ovechkin. Head-to-head since 2011 has been close, but Crosby has been just a touch better. That was the case too in 2009. Back then we thought the Crosby vs. Ovechkin show would be an annual event. Instead we had to wait seven years. The score is 1-0 Sid. For Ovechkin to even it up, he’s going to have to be the better man this series. THN’S PICK: PENGUINS in seven games.